On Friday night, one of the legendary coaching figures in the Vestavia Hills school system coached his last game. Pizitz Middle School coach John Rush is retiring after 37 years coaching football and basketball at the school. “Middle school is a tough age and I am getting, like, old,” Rush said with a bit of a chuckle. “I’ll be 62 in April. Rush’s final game as head coach was a loss to Simmons Middle School in the third-place girls basketball game of the Metro South Tournament. “I ended on a loss and I lost my last football game,” Rush said. “I hope my career is not defined by that,” he added with a hearty laugh. Rush doesn’t know what his coaching record is or how many league championships he has won. He said his main goal was to make sure the athletes had a posi- tive experience. Athletics has always been a part of Rush’s life. He was a three-sport star at Mountain Brook and quarterbacked the Spartans to a 7-3 record under coach Robert Higginbotham in 1974. Rush played baseball at the University of Montevallo before beginning his coaching career at Warrior Academy near Tuscaloosa. 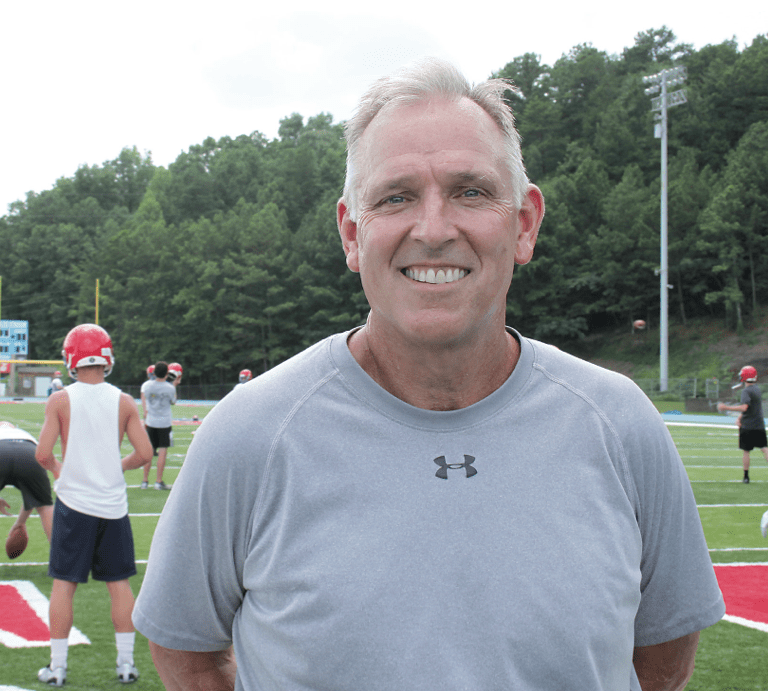 He came to Pizitz in 1981 after being hired by the late Thompson “Mutt” Reynolds, then Vestavia’s athletic director and Pizitz’s head football coach. Rush replaced Reynolds as the Pizitz head coach in 1986. Rush’s middle school teams sent a parade of athletes to the Vestavia Hills High School pro- gram, fueling the Rebels’ success. He enjoyed a special relationship with the coaches at the high school, especially Rebels head football coach Buddy Anderson. Rush also was surrounded by talented coaches at Pizitz, includ- ing John Wyman, Dal Davis, Mark Woodruff, Tyler Tidmore, Malcolm Prewitt and trainer David McKenzie. “I’ve been very blessed to work in the Vestavia system and work around good coaches at the high school and at the middle school,” Rush said. “They helped me a lot over the years. Rush will finish the school year as a physical education teacher at Pizitz before his retire- ment becomes official. He’s not sure what he’s going to do next. He recently remarried. His wife, Wendy, works at Briarwood Christian elementary school.